Your Bird May Learn to Mix His Own Drinks! 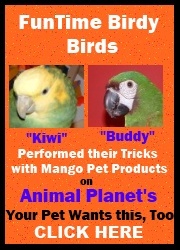 This is a great educational bird toy that your bird will really have to think to master. Watch how he learns to bring the colored swizzle sticks over to the appropriate colored holder. Base measures 12" x 3". Contains 4 colorful acrylic swizzles measuring 3" x 1.5" Each swizzle has an acrylic peg which makes picking up the pieces and carrying them to the proper hole easy for your bird. Swizzle Sticks Educational Trick Training Toy for Amazons to Macaws5DeAnnaFebruary 16, 2017Jordan (my B&G macaw) really likes interactive games so I knew this would be a hit. Acrylic works great for him and we love the bright colors. We've only had the toy for a few days but his very first try he dropped the swizzle right in the cup. (Mind you, we haven't been as successful in subsequent attempts but he'll get it.) This toy is going to be a favorite of ours. Swizzle Sticks Educational Trick Training Toy for Amazons to Macaws5Kiwi's MomJuly 16, 2015I bought this for my blue front amazon several months ago. He took an immediate liking to it (probably because the sticks look like candy)! He takes the sticks out, puts them back in, puts other little beads/toys in the "cups" instead of the swizzle sticks... He hasn't got the "color matching" part of it, but he sure does enjoy it! I keep it on the bottom of his play stand all the time instead of as a special training prop because he's always messing with it. It is also well made and easy to clean.